I’m happy to report that Alyssa’s Law/A764 was released from the Assembly Education Committee this morning. The vote was unanimous, and the bill has now been referred to the Assembly Appropriations Committee. I attended the hearing and testified in favor of the bill, and also read a brief support statement from the Alhadeff family. It was a very emotional experience, especially because I had a photo of Alyssa with me (shown at left) to display for the Committee members, so that they could put a face to the name on the bill. There were several other groups in attendance who indicated that they were there in favor of the bill, and did not need to testify, including the New Jersey Principals and Supervisors Association, the New Jersey School Board Association, and the New Jersey Education Association. 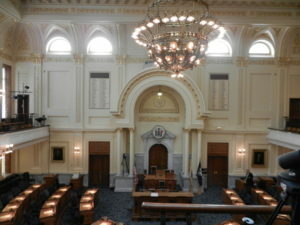 The only objections to the bill were raised by a representative from the New Jersey Electronic Security Association. He testified that while he’s not opposed to the bill, his group wants to see a national standard referenced in the bill, and requested amendments that would make the mandate more specific. From what I gathered, he would prefer if the bill includes mandates for the installation of additional alarm equipment, not just a light and a panic alarm–he mentioned cameras, fire alarms, and intercoms as examples. [The NJESA represents over 300 security and fire alarm companies in NJ, as well as fire alarm manufacturers and distributors, and companies who maintain those systems.] His request was denied at this time. One of the common misconceptions with this bill–something that the NJESA representative unfortunately perpetuated in his comments–is the notion that this bill mandates a “panic button” that might–somehow–be accidentally activated by a student or teacher when no emergency actually exists. However, A764 refers only to emergency lights and panic alarms–the word “button” is not mentioned anywhere in the bill, despite the tendency some have for using that terminology. I disag ree with this call for specificity: in fact, I think one of the bill’s strengths lies in its flexibility in allowing schools to choose the system that works best for them. The purpose of a panic alarm is get a rapid response from law enforcement in the event of a life-threatening emergency. Unfortunately, many people seem to have this Hollywood image of a big, cartoonish button sitting on a desk that you press to get the cops to show up. In reality, panic alarm systems are far more varied and sophisticated, and the ones that I believe hold the most promise are app-based alarms (the photo shown below depicts one such product, known as Rave), which allow teachers and administrators to initiate not only a panic alarm to the police, but also an immediate lockdown and school-wide notificati on simultaneously. The perception that students–particularly in an elementary school–would have access to an actual button or panic alarm activation sequence is misguided. One of the things we’ve learned from past school shootings is that law enforcement notification and rapid response time is critical. At the shooting in Parkland, some of the first 9-1-1 calls came from parents who weren’t even in the building–they called the police based upon texts received from their children who thought they heard gunshots. If a teacher or administrator at Marjory Stoneman Douglas High School had access to a panic alarm, the entire school could have been put on lockdown and law enforcement informed of the situation in the time it took just one student to text their parent. This type of common-sense safeguard is long overdue. 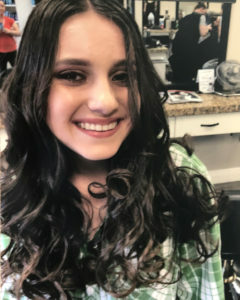 I’m grateful to the members of the Education Committee for seeing the bill’s merits and voting unanimously to release it today, and especially to Assemblyman Caputo, for honoring Alyssa Alhadeff by naming the bill after her. The bill has now been referred to the Assembly Appropriations Committee. An update will posted when the bill is slated for a hearing there. I encourage those who support Alyssa’s Law to reach out to their local legislators in the Senate and Assembly, and ask them to sign on as a sponsor of S365/A764. 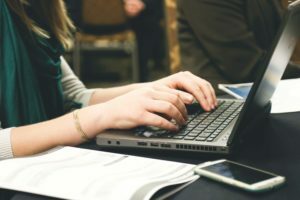 At that link, you’re able to select your municipality from a drop-down menu, choose the legislators for that district that you want to contact, and fill out a quick-and-easy online form that will email all three of them at once. Very convenient! Be sure to mention the bill number (S365/A764), tell them that you’re counting on their support for this bill, and ask that they sign on as a sponsor if they have not already done so. THANK YOU for your ongoing support of our efforts to get Alyssa’s Law passed and signed, so that we can enhance security measures at all NJ schools.